One if the easiest ways to find Andromeda is to us the constellation Cassiopeia. Cassiopeia appears in the northeast sky at nightfall and swings high to the north as evening progresses. Note that one half of the W is more deeply notched than the other half. This deeper V is your “arrow” in the sky, pointing to the Andromeda galaxy. The first path to Andromeda starts from the constellation Cassiopeia (upper left in the chart). This is a circumpolar constellation, which means that it is always above the horizon at mid-northern latitudes, opposite the North Star, Polaris, from the Big Dipper. Its five second-magnitude stars form a distinctive “W” shape. We can use the right side of the ?W? as an arrow head pointing towards the Andromeda Galaxy. Using the height of the W as a measure, go three W heights in the direction the arrow head points, and you will be close to the Galaxy. With a binocular and a dark sky, Andromeda will appear like a small pale puff of smoke, slightly elongated. 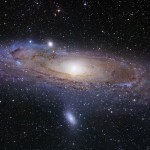 What is the Andromeda Galaxy (Messier 31)? A spiral galaxy like the Milky Way, Andromeda contains a concentrated bulge of matter in the middle, surrounded by a disk of gas, dust, and stars 260,000 light-years long, more than 2.5 times as long as the Milky Way. Though Andromeda contains approximately a trillion stars to the quarter to half a billion in the Milky Way, our galaxy is actually more massive, because it is thought to contain more dark matter. From Earth, the Andromeda Galaxy is 2,538,000 Light Years away and the nearest galaxy to our own.